Full disclosure: I have intentionally put September’s debt update off (which is why its now October and just barely going up). Anyone who has had some serious debt to repay (like me!) knows it’s a road full of ups and downs. One month I’m flying high! Another month I’m down in the dumps. September was a down in the dumps type of month. First, I’m so over Navient. Over it! I’m considering doing a loan consolidation just so I can get rid of them as a loan service provider. I don’t want to rush into anything impulsively just because of frustration. Overall, I prefer to keep my loans separate because I enjoy knocking them off one at a time. Plus, I don’t know how it all works when you consolidate if I’ve got some subsidized and some unsubsidized loans. And I’m currently on income-based repayment and I think consolidation companies don’t do that (right? Because aren’t they independent companies – not government backed anymore? I have no idea, clearly I haven’t researched it). I’m just SO OVER Navient I’d do just about anything to get rid of them! Tips/thoughts on consolidation? Right now I’m still waiting to hear back from the mediation company (I referenced in Monday’s post), so no immediate plans for consolidating, but definitely something in the back of my mind. Second, hubs had another rough month at work last month. Again. This year has been a down year for his business. It’s depressing for him as well as for me (and our budget!) So a lot of my income has had to go to pay bills instead of being all this extra gravy that I thought could be thrown toward debt. Overall we still did have a higher debt payment this month than most months, but it wasn’t near the mammoth-sized debt payment I was hoping for (for comparison: most months we’re around $2,000ish. This month was over $2500. So we did good, don’t get me wrong! But I was hoping/planning for closer to a $5,000 month). And third, the car. I had a secret goal to get our car loan under 10K this month. Remember my overall goal was to get it paid in full by the end of the calendar year. But when hubs checks weren’t as much as we’d hoped, my planned debt payments got diverted elsewhere, and I wasn’t able to swing a large enough payment to drop us below $10k on the car loan. To me, in my mind, that’s basically the last nail in the coffin which assures me that there’s no way we can pay the car off in full by the end of December 2015. To be fair to myself, that goal was always a bit of a stretching goal. 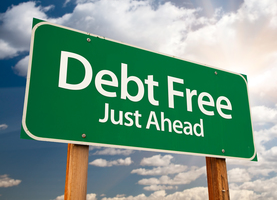 I still have full confidence we’ll be 100% consumer debt-free by the time we go on our cruise (in April 2016). But I so, so wanted to have it paid in full by the end of December. To start the new year consumer debt-free. I want it so bad I can taste it, folks! It causes me physical pain (like an upset stomach) to know we can’t make that goal. But we just can’t. We’d have to pay $3,333/month just on the car, alone, to make the goal. Not gonna happen. (tear). So, that’s why I’ve put off this debt update. I hate that so many of my posts have been Debby-Downer status lately. I’m really sorry about it! I don’t mean to be a big bummer and all “boo hoo” but it’s just been a tough month. So, to turn a new page, let’s look forward and not behind. I LOVE October! One of my favorite months of the year! I love the Fall weather, I love the fun festivities and community activities that are offered (many of which are free!)! I love spending so much time outside and playing at parks with the kids (also free!). I love that as my girls are getting older we’re able to do so many fun things! Remember, I missed Halloween last year (it was my friend’s wedding day), so I’m SUPER pumped for Halloween this year (and already got them cheap costumes from Costco)! Basically, a lot of good GREAT things to look forward to! Debt payments are just one of them. One thing to note, my “beginning” debt balances are all out of whack now for my student loans since ACS sold one of my loans (approximately $12,500) to Navient. I need to try to adjust it to account for the loan transfer but I just can’t be bothered right now. Seriously, every time I think about Navient I have this terrible visceral reaction. But I’m not going there right now. Focusing on the positive. So, yeah. Just a heads up about why that’s all wonky. 1. What do you think about consolidating student loans? Pros? Cons? Personal stories or experiences welcome! 2. When you’ve failed to reach a big goal or milestone (whether related to debt or not), is there anything you do to try to get over the disappointment? Any tips to pick up my spirits a little? I haven’t consolidated my loans, mainly because I much prefer being able to direct exactly where my payments go and work on paying them off in chunks. I’ve already paid off 2 of 5 this way and I’m about 7 months away from paying off another! If I don’t meet a goal I look back over the goal and try and find out why it wasn’t met. Did the money NEED to go somewhere else? Did I simply WANT those dinners out more? Then I look ahead and set more realistic goals. Maybe instead of paying off a student loan in 1 year, I instead make a goal to have the balance down to $xxxx. Or instead of vowing to make 1 extra $500 payment, I split it up into 10 $50 payments, which makes me think its more realistic. Mmm, I love fall foods, too! And happy early birthday to you! You don’t get to choose your servicer when you consolidate, so you could still end up with Navient, and even if you don’t, whoever you do end up with could sell to them later. Also, the interest rate on a federal consolidation loan is the weighted average of your current interest rates (usually the average + .25%). So your interest rate will go up. I’d investigate some of the private student loan refinancers like SoFi if you’re serious. The Student Loan Sherpa blog has a lot of info on this. Are you eligible for a federal consolidation loan? https://studentloans.gov/myDirectLoan/whatYouNeed.action?page=loanConsol It sounds like they have an IBR option. I never did IBR, but I’m pretty the federal consolidation is what I did. It was like 12 years ago that I consolidated, so I don’t remember the details. My loan is serviced by Great Lakes (I have no idea what determines the servicer, though), but I can see online who is holding the debt. It’s changed a couple times over the years. I think the catch with Federal consolidation is that you can only do it once, unless you have another federal loan to roll in. And maybe that you can only consolidate federal loans. Don’t consider me an expert, though! But if you haven’t looked into these yet, it’s something to research. Thanks for the link! I’ll have to look into it further! I think you might be getting consolidation and loan refinance confused. Consolidation stays government backed. I believe you can’t choose your service provided. Loans are weighted and averaged to get the new interest rate. So you would be losing flexibility because you could no longer fast track the higher rate loans. I don’t really see any benefit to doing this really. My consolidated loans are with navient so I don’t think this would help at all. I have heard good things about Sofi, but they are fairly new. It is “consolidation” in the sense that it consolidates all the loans you want into one loan, but Angie is correct. It is really refinance. She is spot on. Thanks for the info – really helpful! Sofi sounds like it’s really worth looking into! Also, aren’t you so glad that you had enough income to cover all the bills & make extra debt repayment, even for a bad business month? And before you got your finances together, I’m wondering if you turned to CCs for a bad month? There is an upside : ). Consolidation just makes all the loans into one giant payment — I think you can ask to change servicers, but it isn’t guaranteed. But you are able to make payments — as annoying as as it is — now. I’d save consolidation for a worst case scenario. This is based on great advice I heard from this really great podcast with a bankruptcy lawyer who specializes in student loans: http://radicalpersonalfinance.com/214-radical-strategies-for-dealing-with-student-loans-interview-with-jay-fleischman-attorney-and-host-of-the-student-loan-show/. If you refinance your loan, then you have to go off of IBR and it turns private, so you lose all of the federal benefits, including any potential loan forgiveness after 20 years of repayment. Thank you so much for the links and tips! I’m going to check out the podcast now! Thanks! Something I do in the fall is re-watch the entire series of Gilmore Girls. 🙂 It’s become an annual event! It always seems to be fall in Stars Hallow and I can binge watch a season in a weekend with Netflix. Yay!